Face Lift surgery is a commonly performed cosmetic surgical procedure. It is most useful in restoring a youthful look to the face by removing excess skin from the facial region to remove wrinkles and other signs of ageing. A facelift surgery is a type of cosmetic surgery which is helpful in removing signs of aging and also removes unwanted blemish that you might feel are diminishing the aesthetic appearance of your face. The procedure requires removing excessive and sagging skin from between the forehead and the lower part of your chin. It also involves lifting the underlying muscle tissues of the skin and tightening the remaining skin over your face and the neck. This procedure aims to restore your face and give you a youthful and fresh appearance. There are several ways that a facelift procedure is performed at Cocoona using highly-advanced cosmetic surgical technology. The exact method will depend on various factors such as the type of incisions used, the extent of invasion required as well as the region of the face that is being operated on. 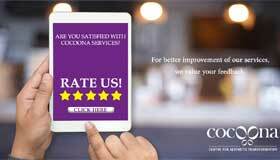 The cosmetic surgeon at Cocoona will take into account certain factors – age, expectations on the result, estimated recovery time, improvement required – to suggest the best method suitable for you. Will make incision from front of earlobe to back of the ear up till the hairline. Will detach the skin from underlying muscles and tissues using a scalpel/surgical scissors. Will then tighten the underlying SMAS tissues with sutures. Sometimes the surgeon might be required to remove these facial tissues. Will remove the excess skin which is visibly loose. Will then close the incisions with staples/sutures. The Superficial Musculo Aponeurotic System (SMAS) layer of tissue is composed of suspension ligaments that lie under the cheek to stabilize them in a fixed position. The tightening of this SMAS layer helps by removing its laxity and gives the face a wrinkle-free look. This technique is used to make the nasolabial region enhanced and more attractive. This procedure involves repositioning a deeper layer of facial tissues along with increasing its mobilization ability. This surgery is used to change the appearance of a flat cheek if the person does not wish to undergo a complete face lift procedure. This is considered a better option for people with sagging cheeks and extra skin folds in the nasolabial region. This gives the person an improved nose/mouth contour and also enhances the roundness of the cheeks. This is the minimal invasive cosmetic procedure and is similar in nature to a full facelift. It does not include neck lift as part of the procedure. This is a better option for people who want to improve the nasolabial folds and sagging lower facial features.This surgery is performed with an endoscope which leaves lesser scarring as well shortens the recovery time period considerably. What are the risks or complications associated with a Facelift procedure? We, at Cocoona, take every possible precaution to ensure that the patient does not suffer from these complications. A facelift procedure has been found to remarkably enhance your physical appearance and also to instill greater self-confidence in you regarding your looks. How old do I need to be for a Face Lift? At Cocoona, we maintain that the minimum age of the person requesting a face lift be at least 40 years of age. This has several reasons, as the inherent skin elasticity and the root cause of ageing are the main factors for requiring the procedure. Is there a need for a drain after a Face Lift? Commonly, the cosmetic surgeon will insert a drain in the surgical site only if the procedure is taking longer than 3 hours of surgical time. However, at Cocoona, we do not use drains as they tend to be bulky and uncomfortable for the patient, rather we use compressive adhesive medical dressings to prevent fluid accumulation.